With the help of real estate agents, builders, loggers and other industry groups, Cindy Younkin has raised more than $160,000 for her Montana campaign. Meanwhile, in Washington, Jim Johnson, who is also backed by builders and property-rights advocates, has raised more than $200,000. And in Nevada, anti-tax crusader John Mason has amassed a war chest of more than $700,000. Along with their impressive dollar totals, these candidates have a few other things in common: They’re all political conservatives, and they’re campaigning for seats on their states’ supreme courts. 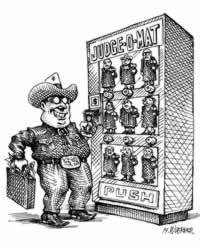 In the West, state judgeships are elected offices. Some states select judges in popular elections; in others, they are appointed by governors or special commissions, but required to run for re-election if they seek subsequent terms. Until recently, the chief influence in these elections has been the liberal trial lawyers who have applied campaign money, endorsements and legwork to elect judges who would be sympathetic to lawsuits against corporations. But since 2000, "business interests have made very strategic efforts to influence judicial elections," says John Echeverria, head of the Environmental Law and Policy Institute at Georgetown University. In the increasing melee, political parties and the U.S. Chamber of Commerce, which represents 3 million business members, are pouring money into targeted races. In the 2002 elections, business interests spent more than $8 million on state supreme court races, lawyers spent more than $10 million, and the political parties spent nearly $3 million, according to the Washington, D.C.-based watchdog group Justice at Stake. It’s a trend that alarms many observers. Whether it’s pressure from liberals or conservatives, "The real threat is to the impartiality of the courts," says Bert Brandenburg, acting director of Justice at Stake. "If judges have to look over their shoulder at special interests, and worry about how they’ll be treated (on election day)," they’ll be more likely to be influenced when deciding court cases. Reformers want limits on judicial campaign spending, or an entire shift to merit-based appointments for judgeships. But reform looks unlikely, and a 2002 U.S. Supreme Court ruling has encouraged even more politicking. Citing the right to free speech, the highest court tossed out many states’ prohibitions on judicial candidates taking stands on issues. So candidates are speaking out, and TV ads are getting as ugly as "barroom brawls," Brandenberg says. This year, Younkin’s campaign in Montana is attracting the most attention from environmentalists. She’s trying to oust Justice Jim Nelson, a former Democratic county attorney who was appointed to the Montana Supreme Court by a Republican governor 11 years ago. Nelson has repeatedly been in a majority of the court’s seven justices, upholding the state’s environmental laws and shaking up traditions such as open range. In particular, he’s defended Montana’s unique constitutional guarantee of a "clean and healthful environment." In a 2002 case about fish poaching, Nelson wrote: "I can only hope the State ... enforces this constitutional imperative the next time some individual or business poisons Montana’s ground, water and air with toxic wastes and pollutants and when laws and administrative rules are enacted which weaken the protections ..."
Younkin, a Republican legislator, has supported some environmental measures, but she has earned low ratings overall from the nonprofit Montana Conservation Voters. She led an effort that severely limited the Montana Environmental Policy Act’s analysis of impacts of industrial developments. She’s "made a career taking the lead in attacking cornerstone environmental laws," says Theresa Keaveny, director of Montana Conservation Voters. Younkin charges that the Montana Supreme Court has been taken over by the "radical left." She points to a study by University of Montana law professor Jeffery Renz, which says Montana Supreme Court justices since 1970 have been "the most active in Montana’s history," overturning a high number of previous court rulings. Asked about the fact that so many industry groups back her, Younkin says, "They don’t think they’re getting a fair shake out of the Supreme Court." And she promises she’ll be impartial if she’s elected to the court. Nelson says he’s "proud of protecting the constitutional rights that Montanans have (since 1972) — at least 17 civil rights and liberties that are not (specifically) protected under the U.S. Constitution." In a state that leans Republican, Younkin has an edge. But as of Sept. 10, Nelson was ahead in dollars — he’d raised about $188,000, largely from trial lawyers and conservationists. It’s expected that significant "soft money" from outside the state will make its way to the race in the homestretch. The author is editor in the field for High Country News.